Welcome to Mesbah OB/GYN. We are dedicated to providing the highest quality health care to women of all ages. In this day and age of large impersonal medical groups, our goal is to maintain a personal connection with our patients. For over 20 years Dr. Mesbah and his staff have been providing state of the art medical services. Dr. Mesbah, Christine and Karen provide care to women from their first gynecological visit through menopause. We offer the complete range of care in obstetrics and gynecology onsite, including 3D/4D ultrasound, fetal testing, colposcopy, endometrial ablation, contraception, infertility and family planning. From high risk pregnancies, to the latest minimally invasive robotic surgery, Dr. Mesbah and his staff can guide you through this important time in your life. 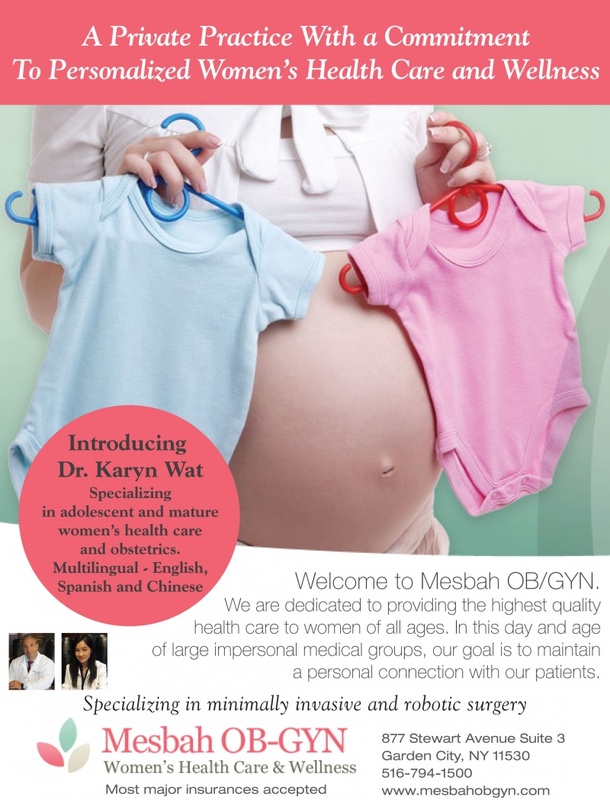 Obstetrician and gynecologist Karyn Wat, M.D., joined Mesbah OB-GYN Women's Health Care & Wellness in July. Dr. Wat is a multilingual doctor who speaks English, Spanish, and Chinese. She will be joining Mesbah OB-GYN Women's Health Care & Wellness starting July 24 to provide obstetrical and gynecological care to women and teens. Dr. Wat has been trained in general and high-risk obstetric care, as well as all aspects of gynecological surgery including robotics and minimally invasive surgery. "She's got great bedside manner, she's personable, and she has great surgical skills," says Michele Mesbah, R.N., a childbirth educator at Mesbah OB-GYN Women's Health Care & Wellness. "She is very compassionate to patients and she'll be an asset to the office." Michael Mesbah, M.D., was recently nominated to be the associate clinical professor of minimally invasive surgery at NYU Winthrop Hospital. Dr. Mesbah has extensive training in gynecological surgery including minimally invasive laparoscopy and vaginal surgery and is a certified robotic surgeon. He has been in private practice for more than 20 years. Mesbah OB-GYN Women's Health Care & Wellness in Garden City is a private practice that serves women of all ages, accepts most major insurance plans, and provides most services in-office, including sonograms. The staff at Mesbah OB-GYN Women's Health Care & Wellness strives to provide personalized, high-quality health care to women of all ages. Dr. Michael Mesbah founded Mesbahobgyn in 2001. His goal was to provide the very best personalized comprehensive care to women of all ages. To care for young women to seniors, treating each individual as "family" spending the time to listen and provide the best treatments and care is of utmost importance. Dr. Mesbah is truly on the "cutting edge" of obstetrics and gynecology from high-risk obstetrics to the latest minimally invasive and robotic surgery. When patients call our office they will always speak to a professional who will take care of all concerns and questions. Michael Mesbah, M.D. is board-certified with more than 20 years of private practice experience. His experience and expertise in obstetrics has made him one of the most respected physicians on Long Island. He has extensive training in gynecological surgery, and is a certified robotic surgeon. Karyn Wat, M.D. is multilingual in English, Spanish, and Chinese. She has been trained in general and high-risk obstetric care, as well as gynecological surgery. She is compassionate, dedicated, and knowledgeable in issues pertaining to teenagers, family planning, menstrual and hormonal abnormalities, and menopausal symptoms.